Over Christmas break, I received a message from a high school graduate, urging me to check out the poetry of Tyler Knott. 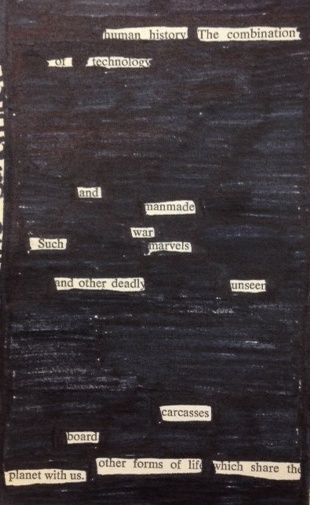 He writes a variety of poems, but I found myself drawn to his blackout poetry. A recent favorite is “Look on the happy side of all things.” Notice how Tyler adds punctuation in his typed version of the poem. I bet you’ve figured out how blackout poetry works. 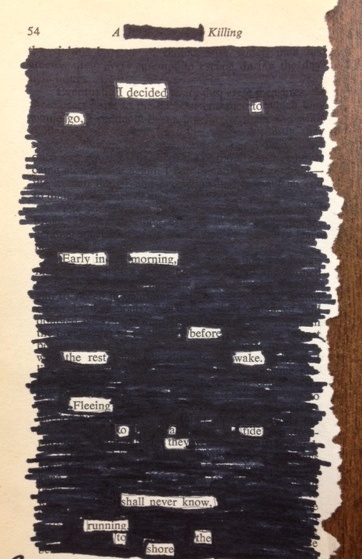 Austin Kleon collected his blackout poetry of newspaper articles in Newspaper Blackout. 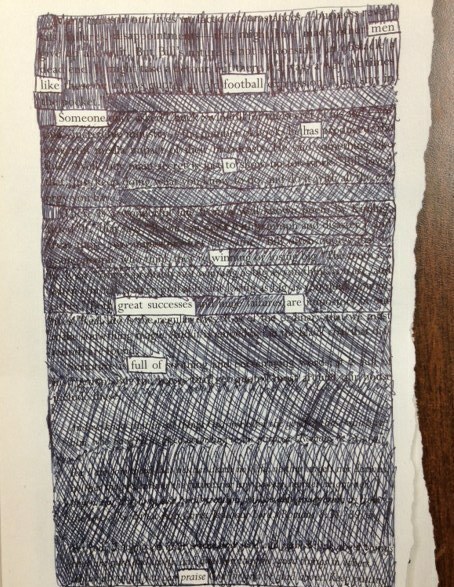 This accompanying video demonstrates the stages of the blackout poetry process. 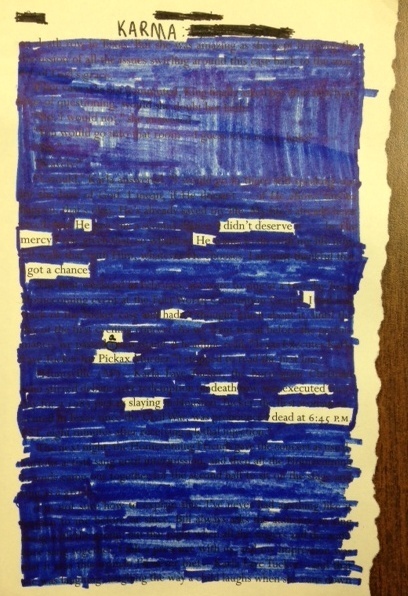 Last year when we experimented with blackout poetry in Creative Writing 1, I gave all my students the same article from the Wall Street Journal about being lovesick. Some teacher in our building had ordered the newspapers but was not using every issue, so I scavenged, and my students and I had a pretty good time. This year our school’s librarian happened to be weeding her collection of books in preparation for the big move to our new library. 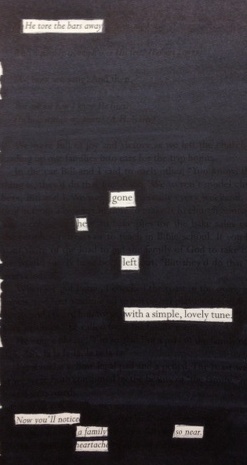 This was great timing for blackout poetry. I grabbed three books for blackout poetry. They were all nonfiction: one was about dog training, one was about whales, and one was religious. I had an office aide rip out some pages from each book, and I gave a pile of pages to each table group. We had already examined Tyler Knott’s poetry, so we were prepared. Students placed a blank sheet of paper beneath their book page and set to work with their markers. The room soon fumed with the smell of 24 Sharpies, and a few of us (myself included) cried out in frustration when we accidentally marked over a word we meant to keep. Some students had the foresight to mark their keepers with pencil before launching in with permanent marker. 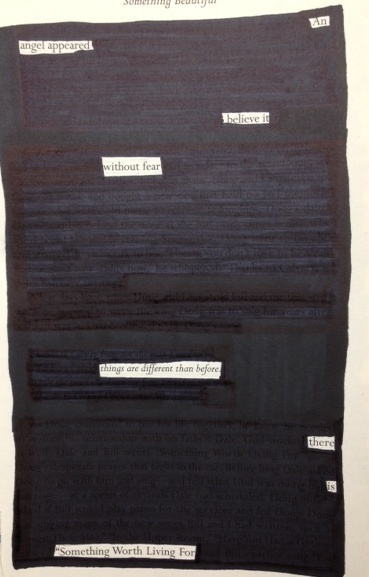 Even if you don’t teach creative writing like I do, you might be able to incorporate blackout poetry into a lesson in your English class. One idea I have but have yet to try is to give students a page from a novel we’re studying and have them create a poem from an important scene in the novel. Now I’m not suggesting you have student deface their novels with Sharpies. You’d have to make some copies of some of the novel’s pages. I don’t think that would be breaking copyright because those copies would be for classroom use and would constitute a tiny fraction of the overall book. Finally, if you have some weeding to do in your own classroom library, consider ripping out some pages of your weeded books before you completely thrown them away. es are full of praise. Things are different than before. There is something worth living for. He tore the bars away. Gone, he left with a simple, lovely tune. The combination of technology and manmade war. board other forms of life which share the planet with us. This is really cool! Hopefully I can find a way to incorporate this with something we read this year. These are fantastic! I’ve done this with my students before and they love this activity.